The Lighthouse Mini Lantern is a small rechargeable lantern from Goal Zero. It fits in the palm of the hand, has a host of ways to hang it and attach it to almost any surface, and can provide a decent amount of light for 500 hours off of one charge. Add in an extra Goal Zero 18650 Battery and you have 1000 hours of light before you need to recharge a battery. Lasts up to 500 hours on low settings! 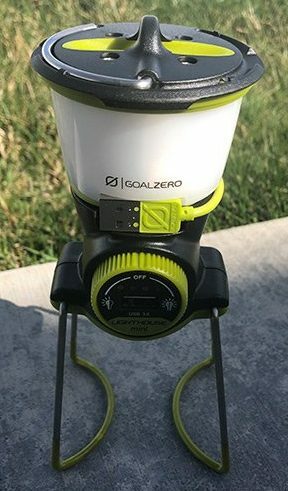 Who Should be Interested in the Goal Zero Lighthouse Mini Lantern? 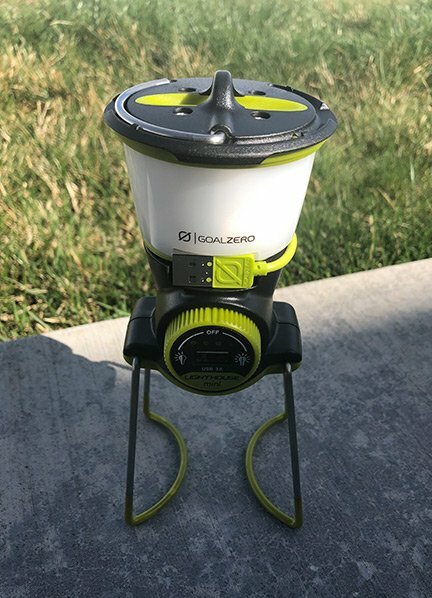 The Goal Zero Lighthouse Mini Lantern is perfect for camping or placement in an emergency kit in case the lights go out. You could put one in a bug out bag, but there are probably better lights for an application like that. Goal Zero Lighthouse Mini with legs extended. 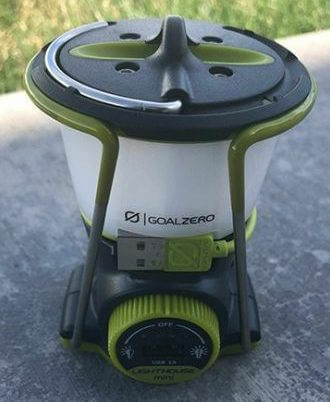 The Goal Zero Lighthouse Mini Lantern is packed full of features for a lantern this small. A majority of the lantern is constructed of plastic, the legs and top hook are metal. A Goal Zero 18650 Battery provides the lantern with its power. The 3000 mAh provided be the battery isn’t the best but it features overcharge, over discharge, overheating and shorting protection. The Lighthouse can be used on its lowest setting with half of the lantern lit for up to 500 hours while throwing between 20 and 30 lumens. At max brightness, with one side lit, it throws 210 lumens for 7 or 8 hours on a single charge. If both sides are lit it will last for about 4 hours on max brightness. Goal Zero Lighthouse Mini with legs folded. Charging time from a USB source runs around 4 hours from fully discharged to a full charge. If you attach it to a Goal Zero Nomad 7 the battery will charge in 4-8 hours depending on how much sunlight is on the panel. What really sets the Goal Zero Lighthouse Mini Lantern apart is its integrated USB cable for charging the battery and the 1 Amp USB port on the front that can use its battery to fully charge your phone. The integrated USB cable also makes it easy to charge from any USB port and ensures that you’ll never lose the cable. The Goal Zero Lighthouse Mini attached to the Nomad 10 Kit. Another great feature of the lantern is its many attachment points. The legs can unfold to give it some height off the surface that it’s sitting on. You can also use the legs as a handle to carry it like a traditional lantern and shine the light ahead of you. The Goal Zero Lighthouse Mini with top hook extended. 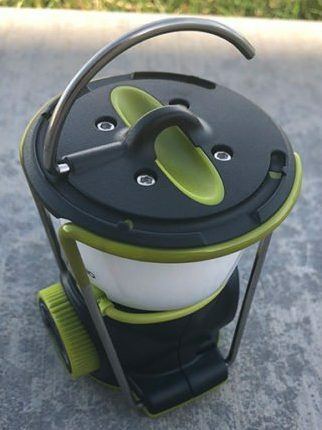 There is also a metal hook and a carabiner slot on the top of the lantern. The base of the lantern has a threaded hole to allow it to be attached to a tripod and a small but powerful magnet that can support the weight of the lantern at any angle. I actually have a friend that uses this lantern as a light while working on his car. He just sticks it under the hood where ever he needs light. The battery has positive and negative connections on both ends. This makes it easy to stick in a device but also make it proprietary to Goal Zero devices. With exposed USB ports, it’s also not the most protected from the elements. The Goal Zero Lighthouse Mini Lantern is almost in a class by itself when you add in all of the little extras this thing has. 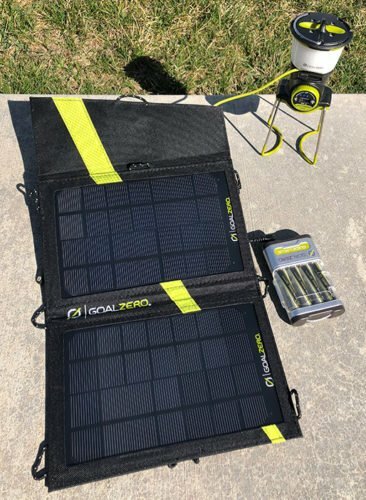 Once again, Goal Zero did a great job of providing a multi-function rechargeable device that really sets itself apart from its competitors. Did this Goal Zero Lighthouse Mini review help you make up your mind? Let us know what you think in the comments section. Be sure to check out our review of the Goal Zero Torch 250 before you take off. Looking for more gear reviews? You can always find more on our prepping gear review page.